Public-health officials in the U.S. are girding for the arrival of a debilitating mosquito-borne virus that is sweeping the Caribbean and could soon break out across large parts of the Americas, Cameron McWhirter reports for The Wall Street Journal. The virus, chikungunya, first identified in 1952 in Tanzania, Africa, has been endemic for decades in southern and eastern Africa, according to the World Health Organization. But in the past decade it has spread to Asia and Europe, causing fever and intense muscle and joint pain for hundreds of thousands of people for weeks and, in some cases, years. Now the disease has popped up in the West Indies, just as many Americans are planning spring-break trips to the region. 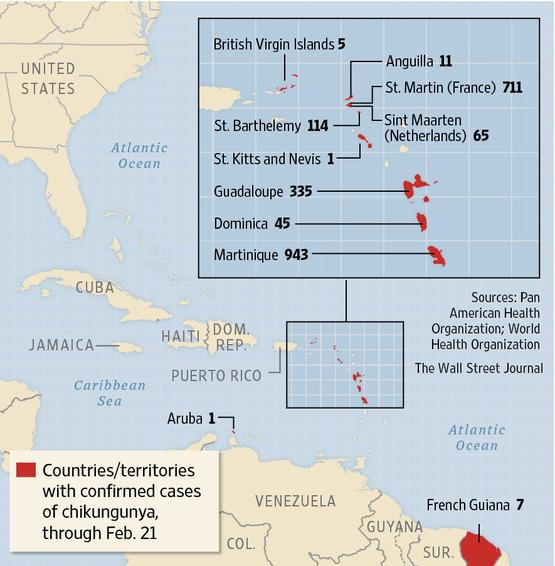 On Dec. 10, 2013, the WHO confirmed the first two cases of chikungunya that were acquired locally rather than imported, on the French part of the island of St. Martin. As of Feb. 21, the Pan American Health Organization, a regional WHO entity, had confirmed 2,238 cases of the disease in the Caribbean—from Martinique to the British Virgin Islands. So far, only imported cases of the disease have been reported in the U.S., Canada and Brazil. But the Centers for Disease Control and Prevention has issued warnings to clinicians across the U.S. to be on the lookout for patients showing symptoms. “We are preparing for the potential introduction into the United States,” said Dr. J. Erin Staples, a medical officer with the CDC’s arboviral diseases branch. The virus is transmitted rapidly by mosquitoes to humans and vice versa. There is currently no vaccine or cure. Besides fever and joint aches, it also causes headaches, nausea and rashes. It is rarely fatal but “people that get chikungunya probably wish they would die” because it is so painful, said Robert Novak, global-health professor at the University of South Florida in Tampa. Experts are concerned because the chikungunya strain in the Caribbean is being spread by a type of mosquito, Aedes aegypti, that is common from the southern U.S. to northern South America, they said. Someone infected in the Caribbean who returns could transmit the disease to local mosquitoes and humans, Dr. Staples said. Because of widespread use of air conditioning and mosquito-control practices in the U.S., the disease may be limited to local outbreaks, “but it’s pretty damn certain what’s going to happen in the rest of the Western Hemisphere,” said Durland Fish, professor of epidemiology at Yale University’s School of Public Health. Mr. Fish predicted widespread epidemics that will overwhelm medical services, as people seek treatment for acute symptoms. Officials in Florida, Louisiana and as far north as New Jersey are preparing for potential outbreaks. The mosquito abatement district of Louisiana’s St. Tammany Parish, north of New Orleans, has budgeted funds for extra mosquito spray, airplanes and helicopters, and plans to coordinate volunteers who, in the event of an outbreak, will go door-to-door to search for mosquito breeding areas in open pools of water. Florida’s Manatee County Mosquito Control District has tested spraying pesticides from helicopters on beaches to control Aedes aegypti and the results have been promising, said Director Mark Latham. Chikungunya’s spread has U.S. public-health officials on high alert because other mosquito-borne illnesses have quickly established themselves in the country in recent years. West Nile virus, a pathogen from Africa that can be transmitted to humans by mosquitoes, first arrived in New York City in 1999. Today, it has spread across the U.S. and from Canada to Venezuela. Chikungunya began spreading beyond Africa in 2004, when major outbreaks erupted in islands of the Indian Ocean, according to Dr. Fabrice Simon, a professor at the Laveran Military Teaching Hospital in Marseille, France, and a leading expert on the disease. One of the worst outbreaks was in 2005-2006, when the illness swept the French island of Réunion. In months, an estimated 250,000 people out of a population of about 840,000 contracted the illness, said Dr. Simon. More than half of patients studied from the Réunion outbreak reported suffering symptoms, including joint aches, years later, he said. Chikungunya outbreaks have erupted in India, China and other parts of Asia. In 2007, the virus reached Italy. “This is a global challenge,” Dr. Simon said.